Mars Roller. 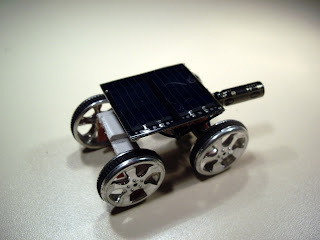 This guy is a really small solar roller, which quite looks like the mars rollers. It uses a 0.33 F gold capacitor, a really efficent gear motor (that I stole from a small broken r/c car of my cousins (melkur, sinkur, wink) ) and a 6v solar panel. This guy charges in 30-40 seconds under direct sunlight, and cover about 10-15 meters at once. I know, its neat. Solar Juggernaut. Probably the biggest solarbot Ive built. 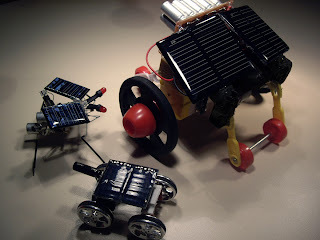 I came to building a big solarbot idea once I figured out that solarbots with small wheels can not move on grassy environments. 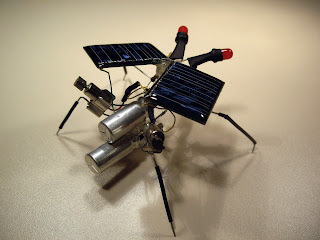 But the idea behind building a solarbot is building a small life form that can take care of himself, by feeding on sunlight, avoiding dangerous obstacles etc. And since most of the life forms in nature, has adapted moving on grassy surfaces, Ive decided to build a big and tough solarbot, which can endure many physical damage, and be able to move on grass with its giant wheels. Solar Juggernaut has 2 walkman geat motors, 2 solarbotics 70 mm rubber wheels, 2 giant 4.5 volt 150mA solar cells and 2 separate operating solarengine that has been completely covered with hot silicone (which makes it water proof. you know. there is something troublesome called rain, in nature.) One day I plan freeing this guy by releasing it in a field or something. It would be awesome if I could add a light weight gps tracker. 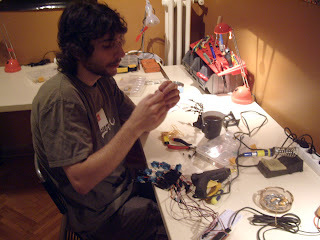 We have recently started building a robotic arm, with Jim Qode. This arm will track your hand movements with a cam, and will play the rock, paper and scissors game with you, in a realtime action. Here are a few photo and video from the development stage. The hand here is the test version, the final one will be more eye candy, as the mechanic parts are designed digitally and will be prepared on a cnc machine with plexiglass sheets. 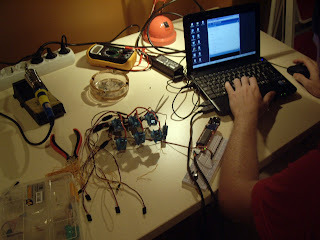 We have used a Sanguino kit to be able to control all the servos. Rock, Paper and Scissors Robot from MrBeaver on Vimeo.